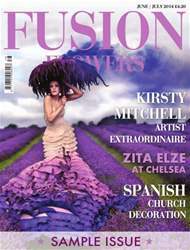 Issue 105 of Fusion Flowers magazine brings you more step-by-step tutorials than ever before. From Beginner through to Master level, there is something for everyone. We even have an original idea for garlanding using just one type of flowers - Hydrangea! 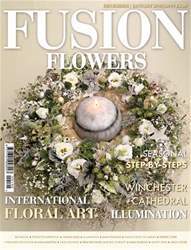 It's rare indeed for us to cover the same Flower Festival twice even when the events are 2 years apart but Illumination at Winchester Cathedral was so wonderful that we had to break our own rule. Angela Turner was the Creative Director for the second time who, together with 325 flower arrangers, created another masterpiece of floral design. We know you will love it as much as we did. Every two years a book is produced which is known as the International Floral Art annual. 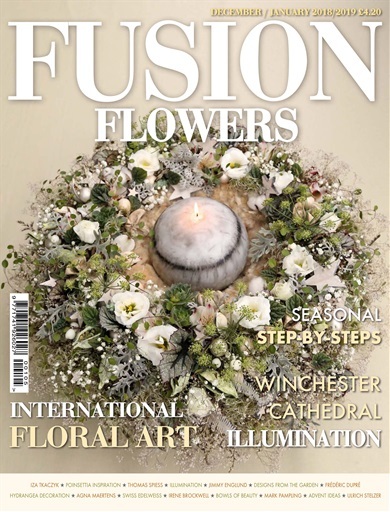 It is literally packed with stunning floral art works and in Issue 105, we have a look at some of the entries including a design by the winner of the coveted Gold Leaf Award. Sue Phillips reports on a treasured collection of black flowers for readers to grow in Garden Notes and we reveal two of the winning designs created by Hanneke Frankema in the Dutch national floristry championship. Plus there is a report on a remarkable village transformation in the Netherlands where roses literally grow on you - overnight!